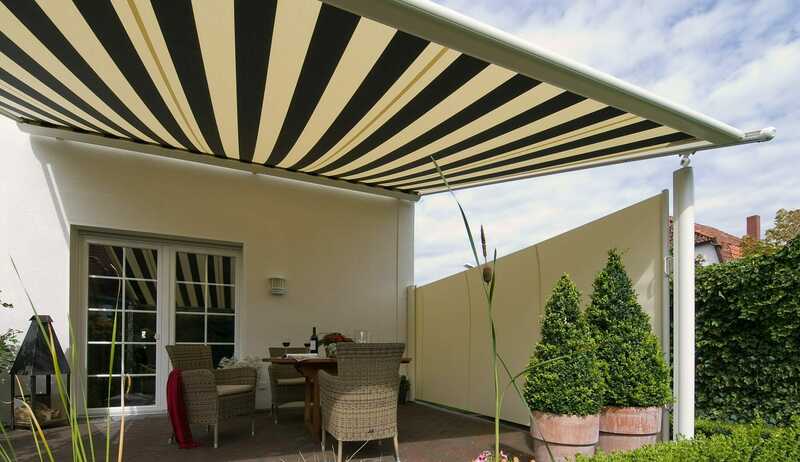 Our garden awnings are built with precise technical expertise which allows you to control and adjust your awnings according to the weather or time of day. Retractable patio awnings are a great way to provide fully adjustable protection whenever you want it. 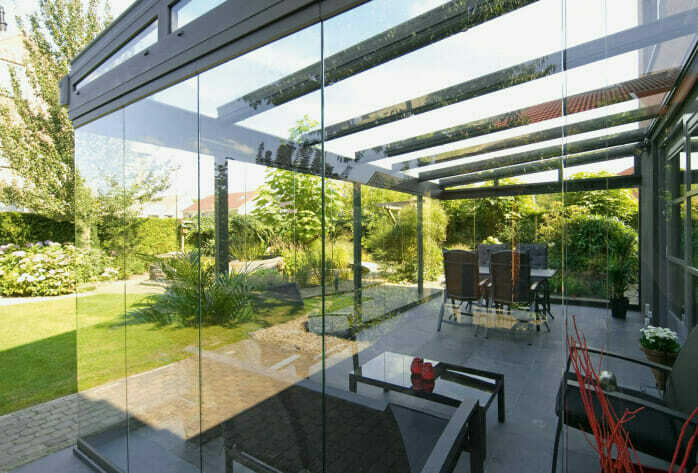 Your garden and open areas are rooms too and with a little creative thought and the right products, you can add a real sense of style and practicality that makes the most of your outdoor living spaces. 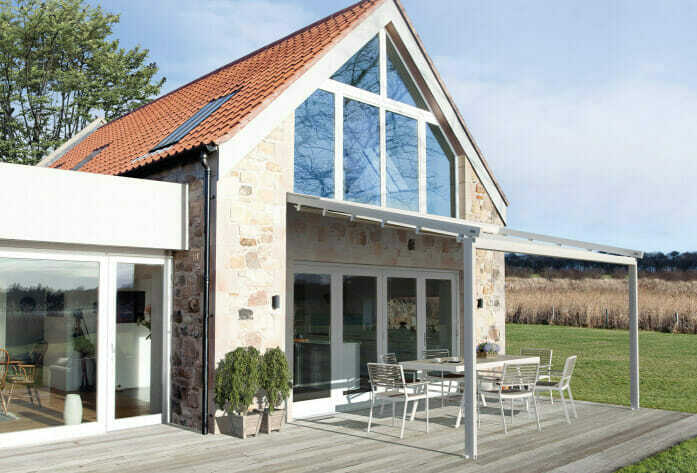 Our attractive and hardwearing designs suit a range of budgets and combined ease of use with convenient storage, to change the way you use your outside space. We also have a wide range of more than 200 fabrics available to provide perfect sun protection. Our bespoke designs are installed by expert fitters who are experienced in creating the perfect environment for you. We can install our awnings anywhere thanks to the unique and tough custom brackets manufactured for your unique space. As a free standing item your awning can be placed exactly where you want it. Our awnings are also certified up to wind force 5 and have weather sensors - the arms are belt operated and have been tested to the highest standards so durability is assured. Our awnings and all components are precision manufactured in Germany - they come with many carefully designed features. 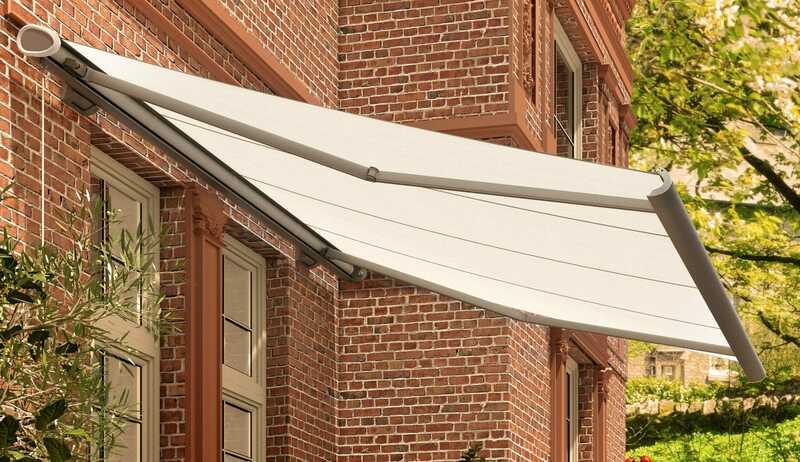 The LongLife arm on all our awnings has a very high-tension force, even in gusty conditions. This means the fabric is exceptionally well positioned. We back this up with a 10-year warranty. 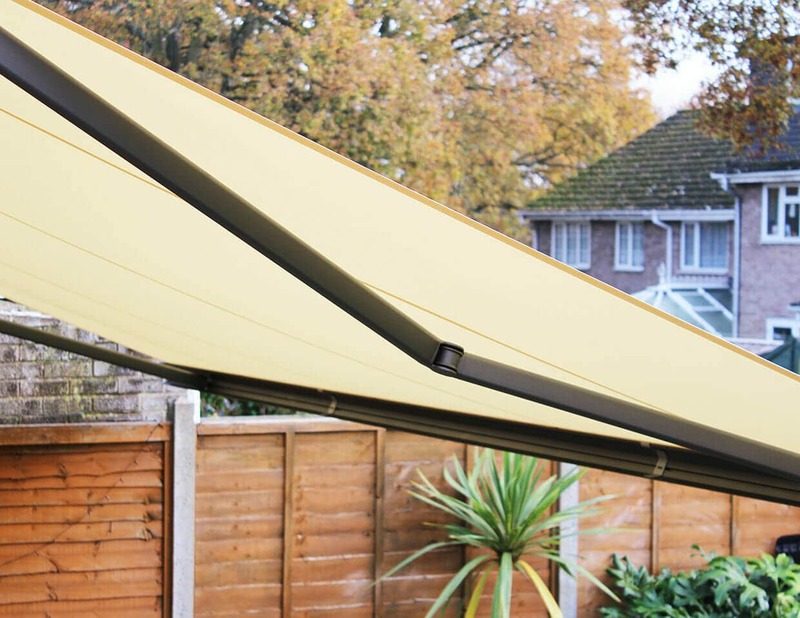 The tilting folding arm with patented wind lock safety device prevents the awning from being lifted up by the wind. 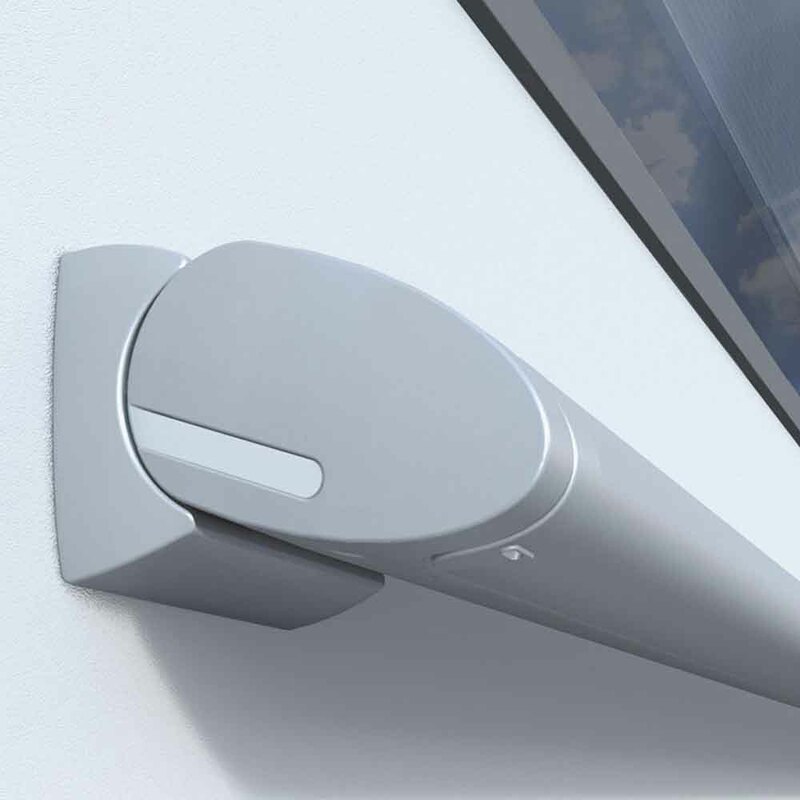 It benefits from proven, maintenance-free technology and all components are made of forged and extruded aluminium. Our awnings have a flat, oval shaped design when folded away - there’s no visible screws to ensure it’s easy on the eye and contemporary. 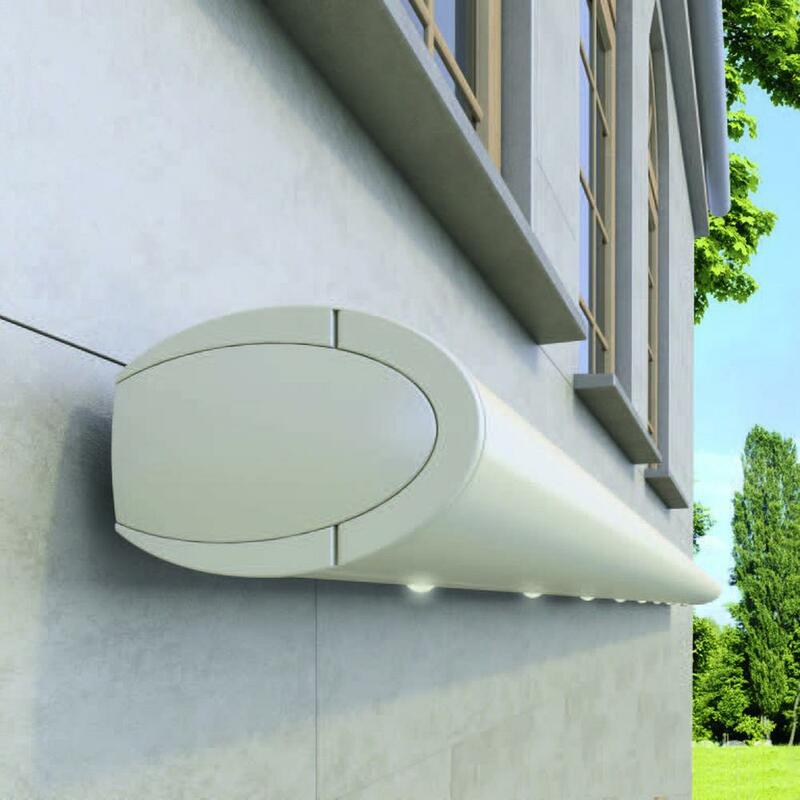 Installation is simple as all awnings with only two brackets affixed to your external wall. Our LED lighting provides a pleasant warm white light in the evenings. It is highly energy- efficient with an operating life of 30,000 hours and infinitely dimmable when used with our bidirectional remote. How long will it take to install our new patio awning? In most situation we will be able to complete the installation of your patio awning in just a few hours. Do I need to do anything to prepare my garden awning for winter? As most of our garden awnings are full cassette style awnings the fabric is full enclosed within the cassette which provide total protection from the elements over the winter months. Are patio awnings easy to operate? Yes they are. Patio awnings can be manually operated via a crank but there is always the option of motorising your awning for simple operation via a remote control. What is the main purpose of an awning? Primarily a cassette awning is designed to be a sun shade but if an adequate pitch is achievable then they can be used in light rain. 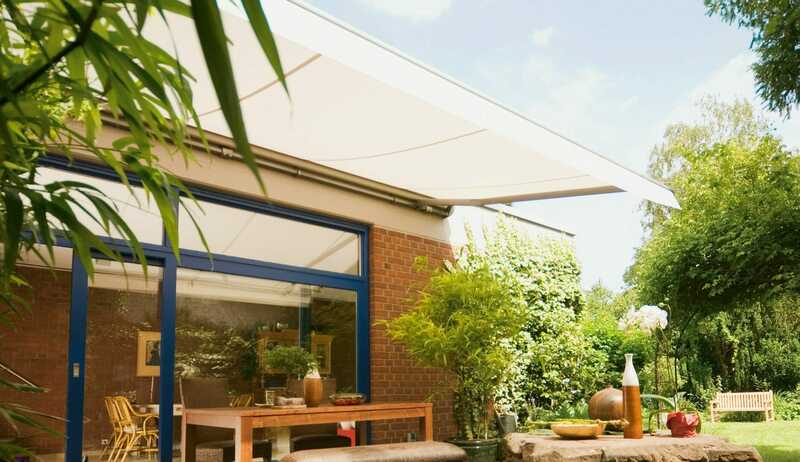 Our garden awnings have also been built with precise technical expertise that allows you to control and adjust your awnings according to the weather or time of day. Retractable patio awnings are a great way to provide fully adjustable protection just when you want it. Your garden and open areas are rooms too. With a little creative thought and the right products, you can add a real sense of style and practicality that gives you much more from your outdoor areas. We are justifiably proud of our range of patio awnings and the useful extras that come with them, including electric remote control. The Cosmos is a sophisticatedly premium shade that oozes class. The Cosmos is packed with the latest awning technology allowing you to enjoy this stunning structure even in the minimal of space. Its perfectly slim design gives it a modern look and feel which will never date. The harmoniously crafted oval shaped cassette gives you peace of mind that the fabric will be protected and it even comes with a 10 year warranty to prove how confident we are that wear and tear will be minimal. There are a number of options you can take advantage of in order to enhance your outdoor experience as well. The Saponaria has a contemporary feel, with modern clean lines that give it an undeniably stylish appearance without compromising on functionality. 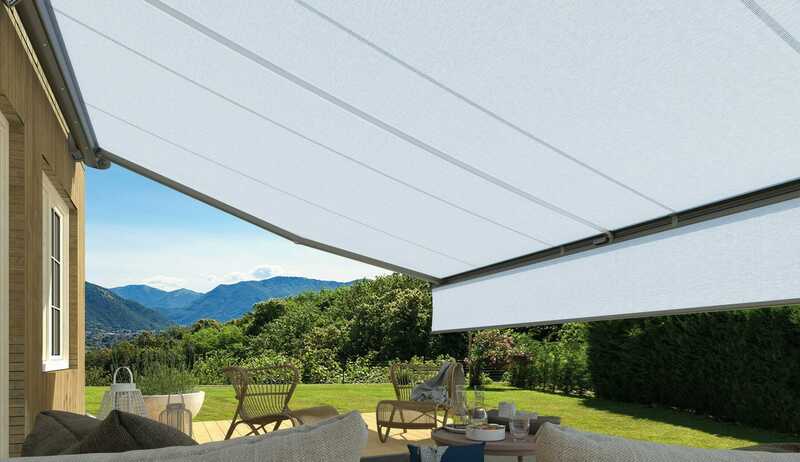 The Saponaria comes with a rich tapestry of features that allows you to enjoy one of the best all- round awnings on the market in the comfort of your own surroundings. Cleaver additions to the structure allow you to enjoy outstanding sun protection during the day and highly energy- efficient LED lighting provides tasteful ambiance during the night. The Saponaria is really in a class of its own. The Olea is where high-performance technology meets outstanding design. It is undeniably convenient yet extremely durable. 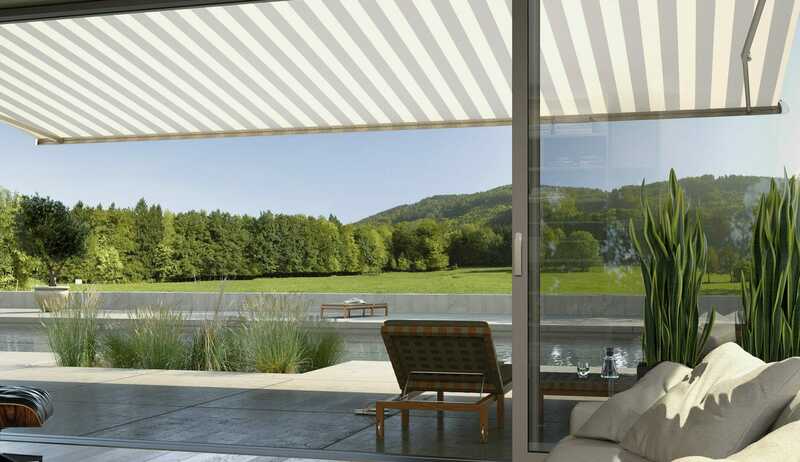 Olea Awnings are built to shade and protect large external areas but also to bring a refined and sophisticated feel with the sleek and stylish design. 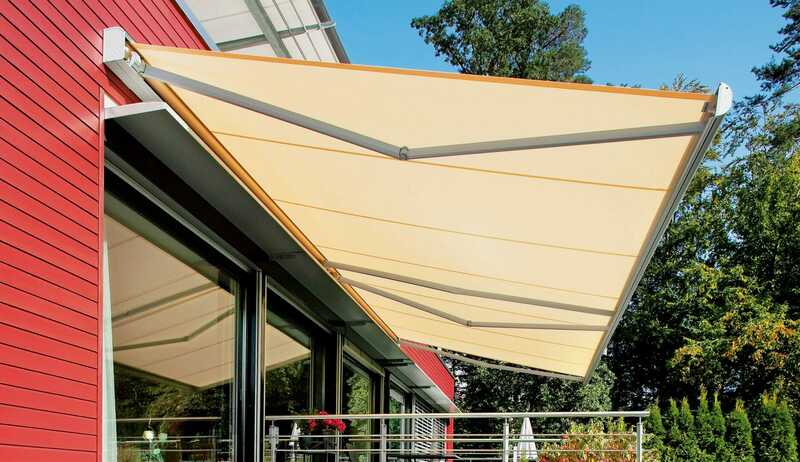 The beautifully-shaped slim line cassette allows the awning to be reliably protected from the elements. 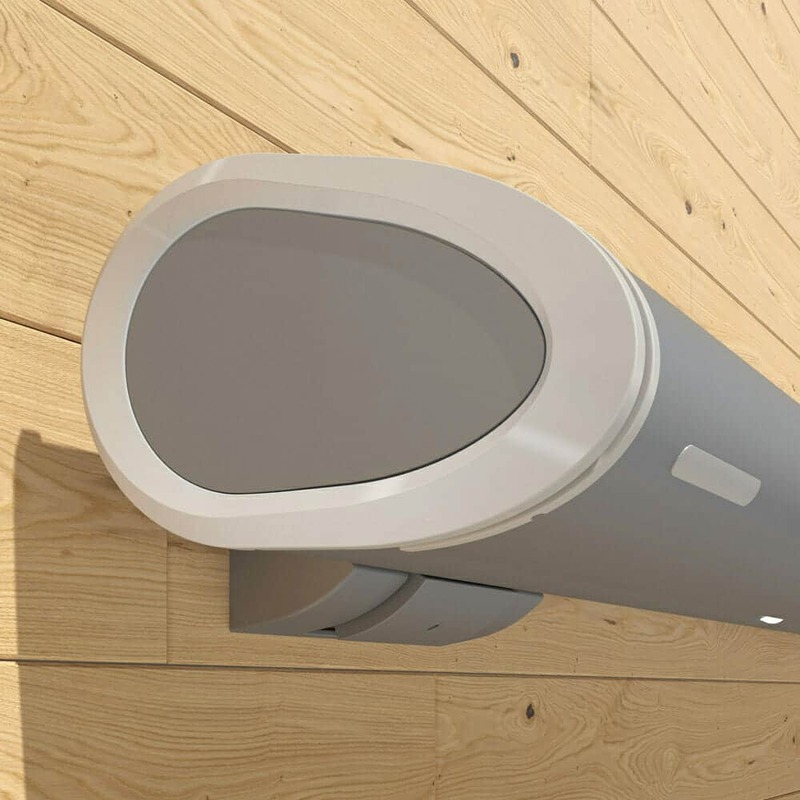 Its innovative two-point connection has been engineered to leave the structure both seamlessly installed yet immensely robust. The Olea is very easy to use, it is undeniably convenient yet extremely durable. As my garden is south-facing it became apparent very quickly that not only did the garden become unbearable in the heat, but that the inside of my home did too. I needed a solution to this, fast. 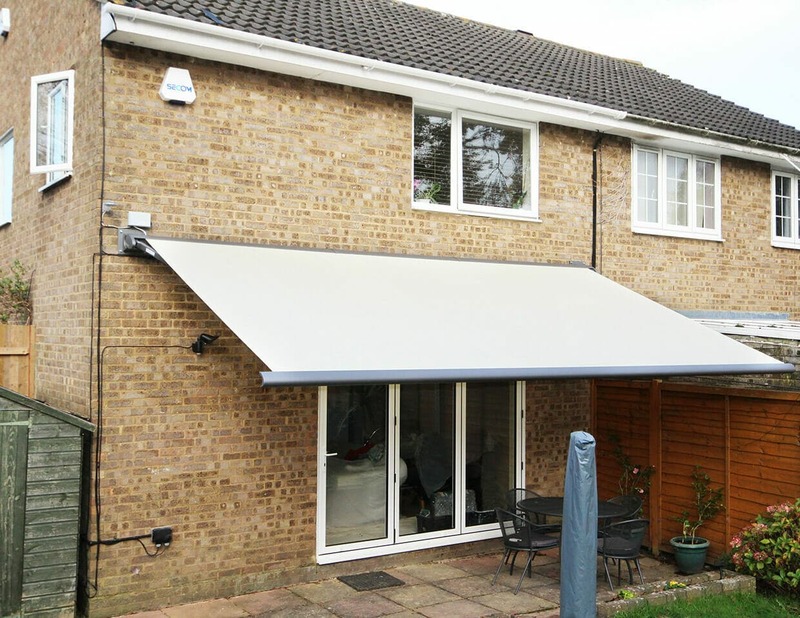 We listened intently to Mrs Harris to come up with a suitable solution to both of her issues by installing a full cassette awning across the width of her home, with a three-metre projection. The full cassette awning was not only more attractive, but from a practical perspective, it protected the material during winter, offering a longer life expectancy altogether. This meant the sunlight was kept out of her living room but still allowed for plenty of natural daylight to flow into the room. I am delighted with the results and would highly recommend The Glass Room Company to anyone. I felt like they understood exactly what I was asking for and did not try to upsell me to something I did not require. The process was so simple and the fitters were very polite, considerate and tidy. I even sit outside on cold days now as my garden is such a relaxing place to be, which is something I never thought would happen.